No More Mess! No More Wasted Toothpaste! This Automatic Toothpaste Dispenser dispenses just the right amount of toothpaste directly on your toothbrush. Holds up to 5 toothbrushes. 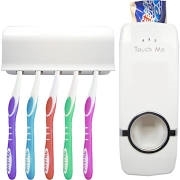 No more mess in your bathroom or wasted toothpaste with the Toothpaste Press Paste Automatic Dispenser with Toothbrush Holder. This toothpaste dispenser neatly dispenses just the right amount of toothpaste right onto your toothbrush with one press. No batteries required. Installs quickly and easily to your bathroom wall or tile by an adhesive pad. Includes a toothbrush holder that holds up to 5 toothbrushes. Automatic Toothpaste Dispenser dimensions: 6.22" x 2.36" x 2.36"
Brush Holder dimensions: 4.33" x 1.97" x 1.57"